The compressive mechanical signatures of dry cereals and snacks, especially puffed, are characteristically irregular and irreproducible. These signatures&CloseCurlyQuote; degree of jaggedness, however, is remarkably reproducible and can be used as a measure of the cereal or snack&CloseCurlyQuote;s brittleness and perceived crunchiness. One way to quantify a signature&CloseCurlyQuote;s degree of jaggedness is in terms of the mean magnitude of its power spectrum, after filtering out the low frequencies. This Demonstration simulates force-displacement curves of varying degrees of jaggedness and their conversion into truncated power spectra using a Fourier transform. Snapshot 1: Simulated smooth peaked force-time relationship and its corresponding filtered Fourier power spectrum (cutoff at frequency 60). Notice the absence of high-frequency peaks. Snapshot 2: Simulated jagged sigmoid force-time relationship and its corresponding filtered Fourier power spectrum (cutoff at frequency 60). Snapshot 3: Simulated jagged sigmoid force-time relationship (same as Snapshot 2) and its corresponding filtered Fourier power spectrum (cutoff at frequency 40). Notice that the cutoff frequency has only a relatively minor effect on the mean power in the high frequencies. Snapshot 4: Simulated jagged peaked force-time relationship and its corresponding filtered Fourier power spectrum (cutoff at frequency 10). Snapshot 5: Simulated irregular sigmoid force-time relationship and its corresponding filtered Fourier power spectrum (cutoff at frequency 10). Puffed dry cereals and snacks, when uniaxially compressed, render a mechanical signature that is both irregular and irreproducible. Nonetheless, it has been shown that the signature&CloseCurlyQuote;s degree of jaggedness is remarkably reproducible and can be used to monitor brittleness loss or gain as a result of moisture sorption or drying [1, 2]. A line&CloseCurlyQuote;s jaggedness can be quantified in different ways. Among them are its apparent fractal dimension, various measures based on the fluctuations&CloseCurlyQuote; standard deviations, and the mean power of the high frequencies part of the power spectrum generated by the Fourier transform (after removal of aliasing) [3, 4]. This Demonstration simulates and plots peaked or sigmoid mechanical signatures reminiscent of the kind encountered when dry puffed cereal or snack particulates are compressed intact. 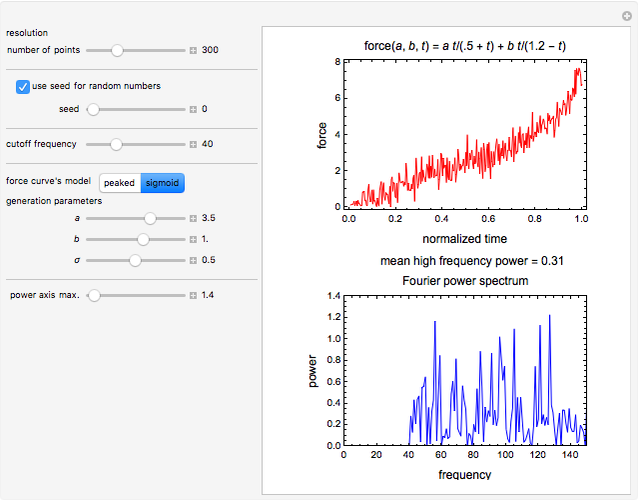 Their models&CloseCurlyQuote; equations are displayed above the plot. Enter the number of points, , to determine the signature&CloseCurlyQuote;s resolution. Enter and to define the general shape of the curve. 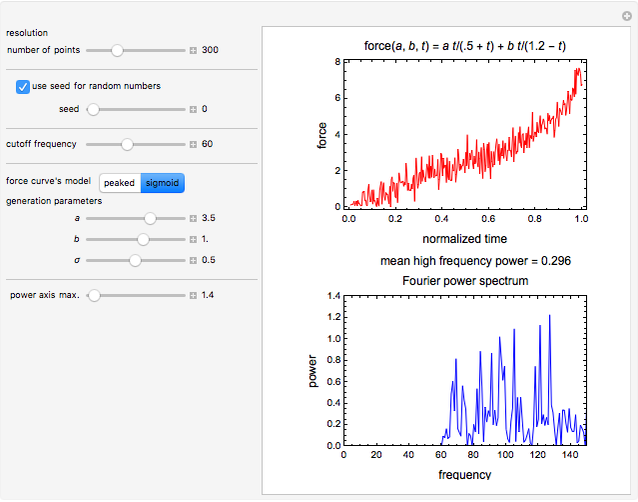 Enter the fluctuations&CloseCurlyQuote; amplitude, , the standard deviation of the superimposed normal noise. 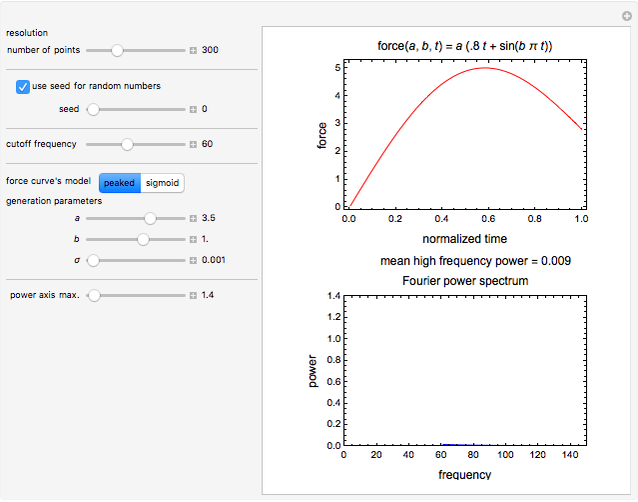 The program calculates and plots the corresponding power spectrum, which can be truncated at a chosen frequency by moving the "cutoff frequency" slider. The mean magnitude of the truncated spectrum is calculated and displayed. Notice that once the low frequencies that represent the curve&CloseCurlyQuote;s general shape are removed, the choice of the cutoff frequency has a relatively small effect on the calculated mean spectrum. M. G. Corradini and M. Peleg, "Solid Food Foams," Food Materials Science: Principles and Practice, New York: Springer, 2008 pp. 169–202. T. Suwonsichon and M. Peleg, "Instrumental and Sensory Detection of Simultaneous Brittleness Loss and Moisture Toughening in Three Puffed Cereal Products," Journal of Texture Studies, 29(3), 1998 pp. 255–274. A. M. Barrett, M. D. Normand, M. Peleg, and E. Ross, "Characterization of the Jagged Stress-Strain Relationships of Puffed Extrudates Using the Fast Fourier Transform and Fractal Analysis," Journal of Food Science, 57(1), 1992 pp. 227–232. M. Peleg and J. McClements, "Measures of Line Jaggedness and Their Use in Foods Textural Evaluation," Critical Reviews in Food Science and Nutrition, 37(6), 1997 pp. 491–518. Micha Peleg "Fourier Power Spectrum as a Measure of Line Jaggedness"